For a while it was looking like there would be no crabs in crabville: With fishing boats on strike for the first part of December, it seemed the Bay Area would be Dungeness less all winter. Thankfully, this has not been the case. Wholesalers came to their senses, the crabby crustaceons are everywhere and the 49ers are going to be in the Super Bowl. What more can you ask for? 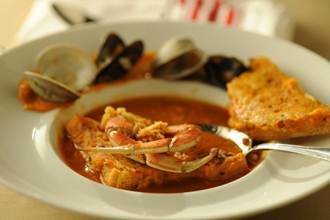 How about a recipe from Michael Mina for a Dungeness crab cioppino? Place crabs on small baking sheet. Pull meat aside and place on another small baking sheet, place shells in bowl and reserve for broth. Reserve picked crab meat for Cioppino broth. Save crab legs for plating in bowl or 1/4 sheet pan. Using kitchen shears, snip a thin segment of shell out of the base of each crab leg to make it easy for guests to access the meat within. Reserve the snipped crab legs on a small baking sheet. Break up crab shells into small pieces. Heat your pan over high heat. Add crab shells to the hot pan, stir, and then add grapeseed oil. Roast shells for 5 minutes. Add basil stems and wine and de-glaze the pan, scraping up any browned bits from the bottom of the pan with a wooden spoon. Reduce the wine by 1/2. Place fennel and coriander seeds in a small mesh tea ball and place in the pot. Stir in diced tomatoes, clam juice and orange juice. Place tea ball with spices in stew. Reduce heat and let simmer 45 minutes. Sit the pot on the stove an keep warm. When it’s time to serve spoon into bowls and garnish with the picked crab meat.